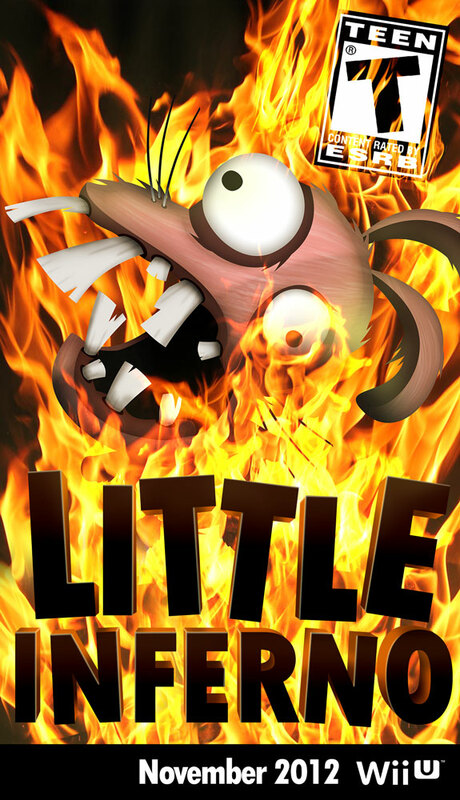 I don’t think we ever actually announced anywhere, except maybe vaguely, that we were shooting to have Little Inferno ready for Day 1 of the Wii U launch, but apparently that news has been discovered by old friend of Hatsworth and World of Goo and super sleuth Mr. Stephen Totilo and the fine folks at Kotaku. So that means mid-November. And we’re honored to be in such sophisticated indie company. For non-nintendo folks, we’re planning to have the Windows version ready the same day, on our site, and on Steam, and possibly on a few other stores still in talks. This is all dependent upon us ironing out the last few details and shoveling in as much coal and hydrocarbons as we can. Lots more updates to follow, including a new trailer in progress that actually shows real actual gameplay – I know it’s been a long time coming. Do you already know that system requirements for windowsx have the game? Any computer from the last year or two should run the game just fine. Two of the three of us are developing on average laptops. Awesome. Did you start running any beta tests ? I hope I won’t have to wait too long for the mac os version (I’m not sure I’ll lay my hands on a Wii U, moreover I bought the game, the day I learnt about it). I can’t wait for the trailer though. Beta builds will start going out hopefully this week, next week at the latest. Thanks for being patient while we figure it out! What happens if I buy the beta after the beta is released. Do I get it anyway? Everyone who preorders will get the game at least a week early. Hey Kyle, quick question. Are U a Nintendo fan yourself????????? Thanks! Also seeing the rated T for the game, I was wondering if it was still family-friendly like WORLD OF GOO was. Yes we all are. 🙂 They seem to share some of our sensibilities. I think Little Inferno is a nice warm family game. Ratings boards can be a little over eager. When can we expect to see the first screenshot of the game? Keep an eye out for the next issue of Nintendo Power magazine. Is there going to be any DLC or a Demo? There will probably be a demo, though we’ll probably release it sometime after the game is available. There will NOT be any DLC, ads, or other spam – a single purchase gets you the real whole full game. One more question : Will it then be available on Android like World of Goo ? What are the language and framework you use ? We’ll start thinking about mobile versions after we’ve got the WiiU and PC versions squared away. No guarantees, though! Will we be notified by email or something for beta tests? Because I really want to play this game! I’ve always been a fan of World of Goo and also creative imaginations like Tim Burton and Zemeckis. I saw this trailer and immediately wanted this game! (I still want to see the gameplay) but the concept alone has me hooked Please let me know how much this will be on the Wii U E shop so I can put it in my budget for games by the end of November. You know what…scratch the Gameplay trailer just take my money! I want this GAME! Day one! One of my top cant-wait-to-play games on the wiiU! When can we finally see the game? Hey Kyle, any 3DS plans after Wii U and PC version launches? Thanks! I think it would be really cool, when you guys try out the hardware! Probably no 3DS version, but we’ll see. good job guys. World of Goo was a Wii masterpiece, and this is no doubt a Wii U masterpiece. Keep supporting Nintendo and please make stuff for the 3DS. I’m surprised the big N didn’t throw a million bucks at you guys to fund this in exchange for exclusivity. They need a launch title badly, especially one that can quickly show people why their weird controls are better than duct taping a slightly more powerful Other Console to a Kindle Fire. Nintendo also needs some fresh mascots to march out, after putting out a stinker Metroid and an average Mario they need to give the old guard a rest. WoG was a title that had exactly everything Nintendo needed, and if it wasn’t already on the PC it would have sold (even more) Wiis. f*****g sh*t!! now i NEED 2 buy wii u!! Huge fan and everything. I sent a message to the facebook group, but thought I’d drop another by here just to increase the likelihood of an answer. Will the Pre-Ordering of the game through this website mean that the Steam version is free (aka, a CD Key?)? Or will two separate purchases be required? (Because yes, I would get both, or just give you twice as much in the Pre-Order additional payment thingy. All of this should be obvious from the whole “huge fan” thing). Just wondering, that’s all. Also… will the soundtrack be free or another thing to purchase? Yes, anyone who buys the game directly from us will also get a Steam key. Including pre-orders. Not sure what we’re doing about the soundtrack yet. It will absolutely be released in SOME form though. Thanks for the response. I have faith in you that this game will be awesome… as you are awesome. So have some of my slightly less awesome money. Already loving the soundtrack preview. I can’t tell if I’m going to be happy or sad if this is better than World of Goo (the most awesome, influential and emotional of all games, soundtrack n’all). So the Mac OSX and Linux versions won’t be day one with Windows and WiiU? Any timeframe on their releases? That’s correct. Nov 18 will bring the Wii U and Windows versions. No eta yet on Mac or Linux versions other than “as soon as we can make them really solid”. I thought I’d take this opportunity to ask if you are getting close to releasing the Linux version. I’ve seen so many LPs, and I can’t wait to burn the world! Thanks! Hey Damon, if you got the game from our website, you’ll automatically have access to windows/Mac/Linux versions of the game as they come available, so no need to worry. In the meantime, other players have reported the windows version runs well in Mac with boot camp. Or if you like, you can still request a refund by emailing us! When is it for mac?